The Holiday Card Hoorah was a great success this year. We collected 2,182 cards to be recycled, which is the equivalent of 36.5 pounds! Thank you for helping us to contribute to the St. Jude's Ranch for Children. We were able to send 1,884 cards to St. Jude's to be recycled, the rest of the cards we will recycle and repurpose into decor, gifts, and more! Check out the Local Food & Film Festival on March 2nd! Don't miss the chance to meet local producers, purchase local food, attend a film and discussion, and participate in a gardening class. This event will be at the Hearst Center for the Arts from 10 am to 3 pm. Free admission and fun for the whole family. For more information check out their website. Donate your used holiday cards to be recycled and repurposed into holiday decor, gifts, and more! We will be collecting from December 10th - January 20th. Collection boxes are located at Maucker Union, WRC, CEEE, Gilchrist Hall, and Rod Library. Cards can also be sent by campus mail, RRTTC office mailing code 0814. Do you want to recycle but aren't sure what all can be recycled? Don't worry, there is a new labelling system that strives to take the confusion out of recycling. This new Australian Recycling Label tells you which parts of the product can be recycled and which parts have to go to the garbage. This isn't only an effort to encourage consumers to recycle more, but also to push manufacturers to use recyclable materials. Here is more information on labelling. A simple way to add sustainable habits in your life now is to look at your daily routine. By looking at your daily routine you can find simple ways to incorporate sustainable substitutes for things like your morning coffee, your daily hydration, your lunch or snacks. We have put together of list of ideas for you to try incorporating into your life. List of sustainable habits. Sign up for an RA Program with the RRTTC! 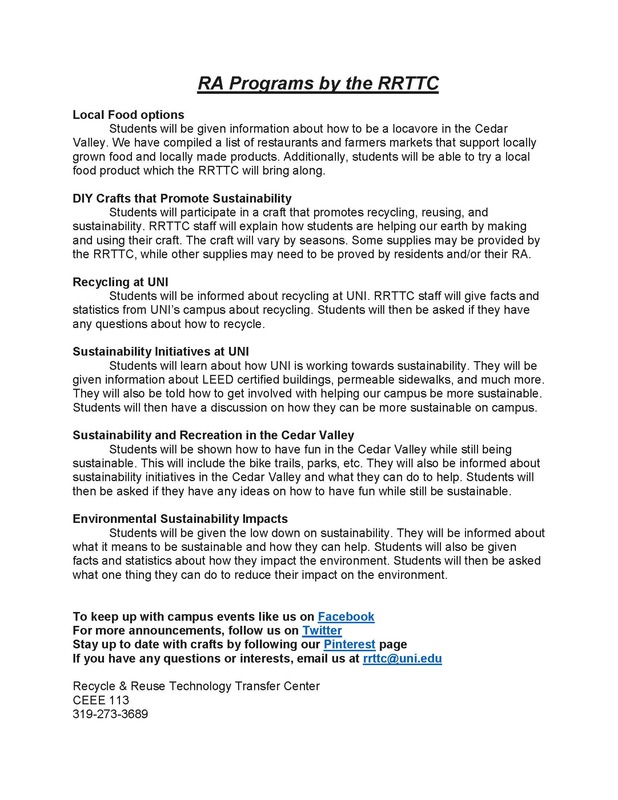 We offer an opportunity for Resident Assistants and their houses to learn more about sustainability practices on campus and how students can be involved. We can also do an interactive activity for residents including DIY crafts! View photos from previous events. 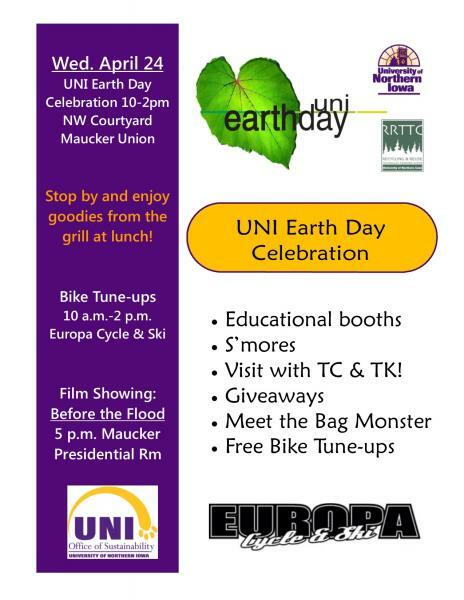 Contact rrttc@uni.edu to discuss a program with our staff and view a complete list of activities for the RA program. Have an idea for a sustainable initiative or project? Want to partner with the RRTTC? Fill out the RRTTC Partnership Application.